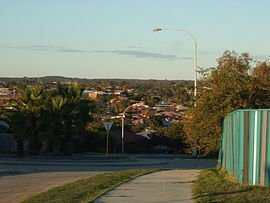 Clarkson is an outer northern suburb of Perth, Western Australia, located 34 kilometres north of Perth's central business district in the City of Wanneroo. While mostly a residential area, it also functions as a town centre, serving many surrounding areas with a vast amount of amenities and facilities. The suburb has a railway station on the Joondalup railway line and also is a major public transport hub for surrounding suburbs. Clarkson is bounded to the west by Mindarie (Marmion Avenue) and to the north by Merriwa and Ridgewood (Hester Avenue). The Joondalup railway line divides Clarkson from the Neerabup National Park in the east. South of Clarkson is Tamala Park, which is uninhabited. It is approximately 2 kilometres away from the Indian Ocean and the coastlines of Claytons Beach and Quinns Beach. The suburb's name refers to the Clarksons, a family of sheep farmers who had held leases of land in the area since the 19th century. Clarkson was originally gazetted as "Mindarie" by the Shire of Wanneroo in 1979, but the two names were transposed in 1985 at the request of Smith Corporation, who went on to develop the Mindarie Keys Marina three years later. The first permanent European settler in the area was Barnard Drummond Clarkson, a sheep-farmer who also held land in Toodyay. Clarkson first acquired a pastoral lease in 1888 of 13,000 acres in the areas comprising modern-day Mindarie, Clarkson, Quinns Rocks and Merriwa. The leases were known as the Mindarie Pastoral Company, and the lands were primarily used for sheep-herding by subsequent generations of the Clarkson family. The ruins of the Clarksons' first homestead and home of the Mindarie Pastoral Company are today preserved in Riverlinks Park on Connolly Drive. The Mindarie Pastoral Company leases were sold off by John Clarkson in 1952. The land subsequently saw no development or settlement until the early-90's, naturally following the completion of the adjacent Mindarie Marina and subsequent residential dwellings in the area. The north-eastern portion of Clarkson around the high school was developed later in 1995. The suburb continued to be built throughout the 2000s (decade), with a steadily growing population. Outside of Clarkson's main commercial zone in the south-west, the suburb consists mostly of residential, detached bungalow housing with vast amounts of parkland. There is a strip of two-storey apartment blocks along Ocean Keys Boulevard, immediately opposite the railway station, and another strip of apartments closer to the shopping centre on Ningaloo Bend. The suburb also contains a larger concentration of public housing than surrounding areas. Ocean Keys Boulevard leading to Clarkson railway station. Somerly is a commercial and housing development in south-east Clarkson, principally surrounding the railway station, that was completed in 2008. The 1,800 lot community was built on a 162 hectare area in a partnership between development company Urban Pacific and the Western Australia Government Department of Housing and Works land development agency Landstart. The project aimed to provide a community-within-a-community with commercial enterprise, fibre-optic to the home internet, and a landscaping package (totaling at $8000AUD) at no extra cost to new home-buyers. The development of the Somerly area made Clarkson one of the largest, most densely populated suburbs in Perth's northern corridor, with a population now approaching 12,000. It is roughly delineated from the older, established parts of Clarkson by Liberty Drive to the north, Connolly Drive to the west and Polglase Fairway to the south-west. A new residential estate under the preliminary name of "Catalina" is being planned for development in 2012. The estate's proposed boundaries lay south of Neerabup Road (which is presently bushland blending into Tamala Park) and extend from the Joondalup rail line in the east, to the coast of Mindarie Beach and Claytons Beach to the west. Although the land is part of Clarkson and Mindarie at present, Satterley, the developers, intend for the estate to eventually be re-gazetted as its own suburb. Clarkson had a population of 7,082 at the ABS 2006 census, an increase of 1,214 persons since the 2001 census. The population of Clarkson is predicted to continue to grow at an exponential rate, peaking at 18,645 in 2026. Only 58.9% of Clarkson's population were born in Australia compared to a nationwide average of 70.9%. The suburb has a significant British-born population, comprising 15.4%, although this figure is minor compared to British populations in neighbouring suburbs, such as Mindarie. Most other major immigrant groups in Clarkson hail from Anglophone countries, such as New Zealand and South Africa. Clarkson has a very young population, with an average age of 28, a figure drastically lower than all surrounding suburbs, as well as the national average age of 37. Income levels in Clarkson are generally in line with the Australian national average, with an average household income of $1,049 per week, compared to $1,027 per week nationally. Christianity is the predominant religious affiliation declared by Clarkson's residents, at 44% of the population, across various denominations. Several churches are scattered throughout the suburb; Clarkson Seventh-day Adventist Community Church, St. Andrew's Catholic Church and Ocean Keys Community Church (Lutheran). 28% of the suburb declared no religion. 2.8% of Clarkson's population is composed of Indigenous Australians, compared to 2.3% nationwide. Only neighbouring Merriwa reflects this trend; the Aboriginal population is much less significant in the suburbs surrounding Clarkson. Compared to surrounding suburbs, Clarkson is a very mixed-use area with an abundance of facilities and a very large shopping and retail district, establishing it as a commercial town centre for the northern suburbs beyond the nearby city of Joondalup. The main road, Ocean Keys Boulevard, is home to the Ocean Keys Shopping Centre, a major shopping mall with a large number of major retail outlets, including Target, Kmart, Coles, Woolworths, JB Hi-Fi, and 115 specialty retailers. Many more commercial outlets surround the centre, including a large Bunnings Warehouse, a post office, two service stations and Toyota, Ford, Holden and Nissan car dealerships. A strip of restaurants and take-away outlets are situated directly west of the Shopping Centre, including branches of Oporto, KFC, Hungry Jack's, Wokinabox, Subway, Eagle Boys Pizza, Sushi Noodle World and Masala Indian Restaurant. There are also other restaurants located within the suburb, such as Nando's and a kebab shop that are both located on the external perimeter of the shopping centre (north-east corner), new Indian restaurants opening near the train station, and a fish and chip shop located at the Clarkson Mini-Mart. The Whale+Ale pub and restaurant is located on the north side of Ocean Keys Boulevard, opposite the shopping centre. It is the only pub and main hub for nightlife in the suburb. There are 3 medical centres in the suburb, which are the Clarkson Family Practice, Ocean Keys Family Practice and The Somerly Central Medical Centre. Clarkson also has a smaller shopping market built in the first area of Clarkson developed. It is located opposite the Clarkson Primary School on the corner of Renshaw Boulevard and Ainsbury Parade. It features the mini-mart store, dentist, bottle shop, fish supply (plus fish and chips) and other small businesses. There is an abundance of entertainment and leisure facilities around Clarkson. Over ten parks are located throughout the suburb, the two main ones being Anthony Waring Park and Richard Aldersea Park in the centre of the suburb. Anthony Waring Park is the largest by area and features sporting facilities. Many smaller parks around Somerly include playgrounds and free barbecue areas for families. The Clarkson Youth Centre, near Ocean Keys Shopping Centre, functions as a community centre and is also part of a wider youth precinct, incorporating a skate park and BMX tracks. Nearby is also the Clarkson Library, one of four public libraries in the Wanneroo area. Clarkson also accommodates the Clarkson Police Station, which serves all surrounding suburbs from Tamala Park to Butler and Jindalee. A Western Power electricity substation is located off Hester Avenue in the north-east of the suburb, near the Joondalup railway line. Telephone services are provided by the Mindarie & Quinns Rocks telephone exchanges. Two state K-7 primary schools are established in Clarkson, serving different parts of the suburb. Clarkson Primary School is the oldest established school and caters to western Clarkson, while Somerly Primary School serves the Somerly estate in the east. Students also have the option of St. Andrew's Catholic Primary School, a private Catholic school located next to St. Andrew's Catholic Church. Clarkson also accommodates Clarkson Community High School, a large Year 8-12 state high school established in 1996. As it is the only state high school in the vicinity (other than the 11-12 Mindarie Senior College), it covers a large catchment area, extending up to Butler and Jindalee in the north. In 2010, Trades North, a TAFE campus specializing in skilled trades and apprenticeships, was built next to the high school and opened for the 2011 school year. It is part of the North Metropolitan TAFE. Marmion Avenue is the main arterial road that links Clarkson to Joondalup and the rest of suburban Perth. Connolly Drive also runs parallel to Marmion Avenue through the middle of Clarkson, approximately a kilometre to the east, and into Kinross and Currambine. Wanneroo Road is nearby and can be accessed via Hester Avenue, Clarkson's northern boundary road. There are no other roads into Clarkson and surrounding suburbs, due to the location of Tamala Park to the south, which creates a 2 km bushland buffer between Clarkson and Joondalup. Work is being completed to extend the Mitchell Freeway to Clarkson from its current terminus at Burns Beach Road in Currambine, with exits to the suburb at Neerabup Road and Hester Avenue. The Clarkson railway station on the Joondalup line was built in 2004 in south-east Clarkson and was the terminus of the line until 2014, when Butler railway station opened. The station provides bus and rail links to Joondalup and Butler, and a direct rail link to Perth. Transdev WA operate the following bus routes from Clarkson station, to all surrounding suburbs. There is one polling booth in Clarkson, at Clarkson Community High School. Along with its neighbouring suburbs, Clarkson is part of the Mindarie electoral district. At the federal level it was formerly part of the Pearce federal division, but was transferred to Moore, along with Mindarie and Neerabup, as of 2010. Clarkson has traditionally been an Australian Labor Party stronghold since the early 2000s (decade) in State elections, in line with many northern Perth suburbs. At federal level, the voting is much less clear-cut, with both major parties gaining consecutive election victories in the suburb since 2001. ^ Australian Bureau of Statistics (27 June 2017). "Clarkson (State Suburb)accessdate=14 January 2018". 2016 Census QuickStats. ^ City of Wanneroo. "Suburb Maps". Archived from the original on 18 September 2011. ^ Western Australian Land Information Authority. "History of metropolitan suburb names". Archived from the original on 19 May 2009. ^ City of Wanneroo. "Foreshore Management Plan: Mindarie - Quinns Rocks" (PDF). Archived from the original (PDF) on 28 March 2011. ^ City of Wanneroo. "Places on City of Wanneroo Municipal Heritage Inventory" (PDF). ^ Australian Housing and Urban Research Institute. "Locational advantage and disadvantage in public housing, Rent Assistance and Housing Loan Assistance in Perth". ^ Urban Pacific (2008-10-13). "Last Available Blocks". Retrieved 2008-10-13. ^ "Somerly sets the pace for tomorrow". The Sunday Times (Western Australia). News Corporation. 2002-12-22. Archived from the original on 2012-11-03. Retrieved 2008-10-13. ^ Urban Pacific (2008-10-13). "Project". Retrieved 2008-10-13. ^ Tamala Park Regional Council. "TPRC Management Committee Meeting". Archived from the original on 22 April 2011. ^ Australian Bureau of Statistics. "2001 Census QuickStats: Clarkson (State Suburb)". ^ Australian Bureau of Statistics. "2006 Census QuickStats: Clarkson (State Suburb)". ^ Ocean Keys Shopping Centre. "Our Stores". ^ City of Wanneroo. "Park Points 20110408" (PDF). Archived from the original (PDF) on 21 March 2012. ^ City of Wanneroo. "Clarkson Youth Centre". ^ Department of Education. "Clarkson Community High School (4160)". ^ North Coast Times, 3 June 2009. "Trades centre for Clarkson". ^ Bus 78 timetable Archived 17 March 2015 at the Wayback Machine, Transperth, effective from the opening of Butler station. ^ Bus 85 timetable Archived 17 March 2015 at the Wayback Machine, Transperth, effective from the opening of Butler station. ^ Western Australian Electoral Commission. "Mindarie Polling Place Locations" (PDF). ^ Crikey. "Moore: Electorate Form Guide".